Abstract: Ubisoft’s Assassin’s Creed does a remarkable – though not flawless – job in presenting a well-balanced game narrative, which incorporates not only a historically justified representation of the Nizari Isma’ilis, but also implicitly corrects one of the most famous Western legends about the so-called ‘Assassins’. 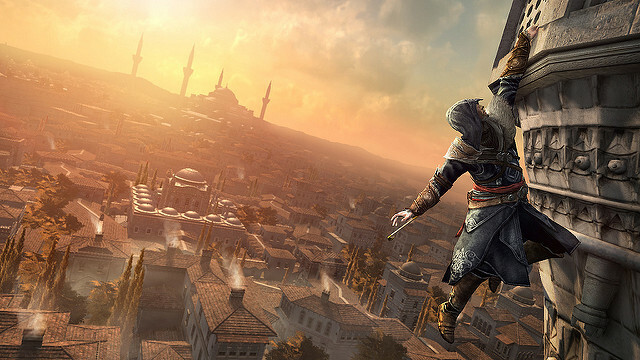 In doing so, Ubisoft succeeds (at least partially) in discarding the stereotypical representation of Muslims/Arabs associated with Western orientalism, at the cost, however, of a multi-leveled but functionalistic view on the phenomenon of religion in the video game series with regards to the Assassin and Templar fractions. Before you can start to enjoy your copy of one of the Assassin’s Creed video games (2007-2014), you first encounter a disclaimer. This stresses that producer Ubisoft has taken all possible precautions to ensure that the game does not violate the religious sensibilities of the public and of players in particular. It could be argued that the number of people who actually play these games is limited in comparison to the consumers of other media, but most of our media consumption is second-hand’. This means that the media texts surrounding games can influence even non-players. Disclaimers are not uncommon in video games and movies. They are used not only to protect the producers from legal action by those who might take offence, but also to underline the moral scrutiny to which the producers have subjected the potentially controversial content of their product. Ironically, this kind of disclaimer typically tends to intensify the perception of the game’s controversial character by explicitly directing attention to it.